We are delighted to have reached our total, exactly five weeks after the shares issue launch and a week before our expected closing date. Thank you very much to all who invested and welcome to Apple Juice! We have been overwhelmed both by the financial support and the enthusiasm people have shown for the scheme and are very grateful to everyone who helped to get the news out there since October 17th. 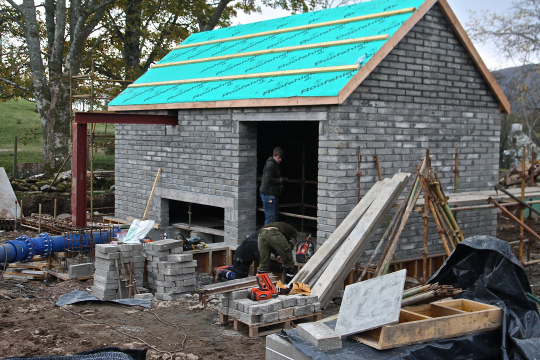 Watch this space for the final stages of construction and the commissioning of the scheme. Since the shares issue was launched on 17th October, we have received a total of £347,700 from 112 investors. We’re delighted that £126,600 of this has come from Applecross residents, which is amazing for a tiny community with a total population of just 225. We urge all those considering investing in the scheme with a view to benefitting from 30% tax relief through the Enterprise Investment Scheme to to do so soon. This scheme comes to an end on 29th November and HMRC will require to see evidence of payments into the bank account by that date. 29th is a Sunday, so it would be wise to invest by 25th November at the latest to ensure that you qualify. We’re aiming to raise a total of £780,000 if we can. If we can raise the total cost of the scheme through shares, the community will benefit from an income of around £25,000 per annum. If we have to borrow to fill a gap then the income to the community will be less, as we will have to pay higher interest rates on a loan and also pay it back faster than shares. It’s clear from enquiries that there are still quite a number of people interested in investing and each day there are 4 or 5 envelopes with application forms and cheques arriving. 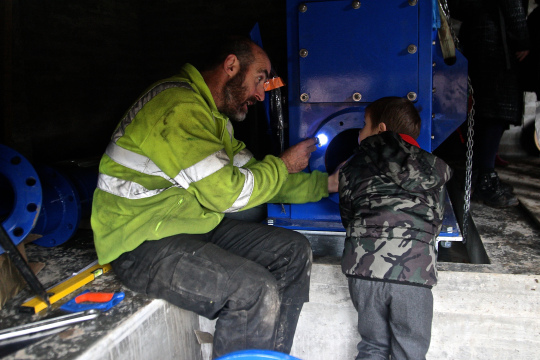 The eleven pupils at Applecross Primary School visited the hydro scheme last week and had the chance to see the inside of the newly installed turbine and hear how it worked. The turbine is a Canyon Pelton, manufactured on the USA. The children were asked to come up with names for it, and suggestions included Hamish Hydro, Calum Canyon and Elton Pelton. 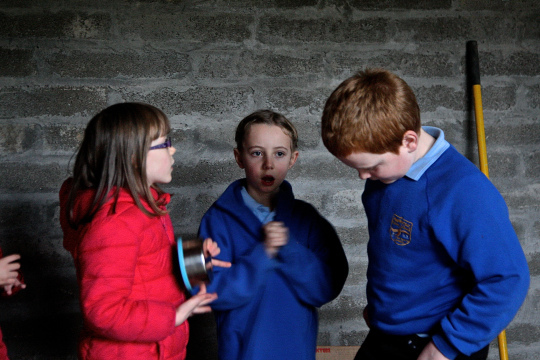 We were impressed by their existing knowledge about renewable energy and it was clear from their focussed questions that they were adding a good understanding of the way our own hydro scheme works to that. We hope that in twenty years time some of these children will be among those making decisions on how the income from the hydro will be spent. Applecross Community Hydro can now be seen on Youtube. Please click on this link to watch our short film which gives a clear explanation of the scheme, how you can invest in it and why you might want to do that. We are very proud that this film has been produced in Applecross thanks to the talents of local people. Valerie Hodgkinson produced the film and designed the branding for all our marketing, Gordon Cameron provided the voice-over, Sean KilBride arranged the music, Ann Fletcher is the piper and Alasdair Macleod provided some of the photographs used. Sean also manages AppleNet, our community broadband scheme, which makes it possible to upload films and photographs. 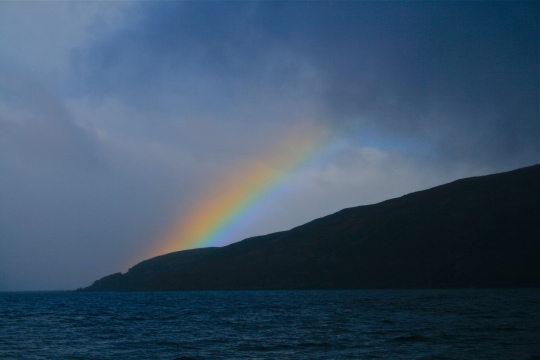 On Thursday I travelled across to Kyle of Lochalsh to get some training from Emma Noble, who designed our website, on adding a blog to the site. This turned out to be much easier than I expected, thanks to wordpress which is more or less idiot proof and to Emma’s clear instructions. Emma grew up in Kyle and let home to study in Aberdeen. 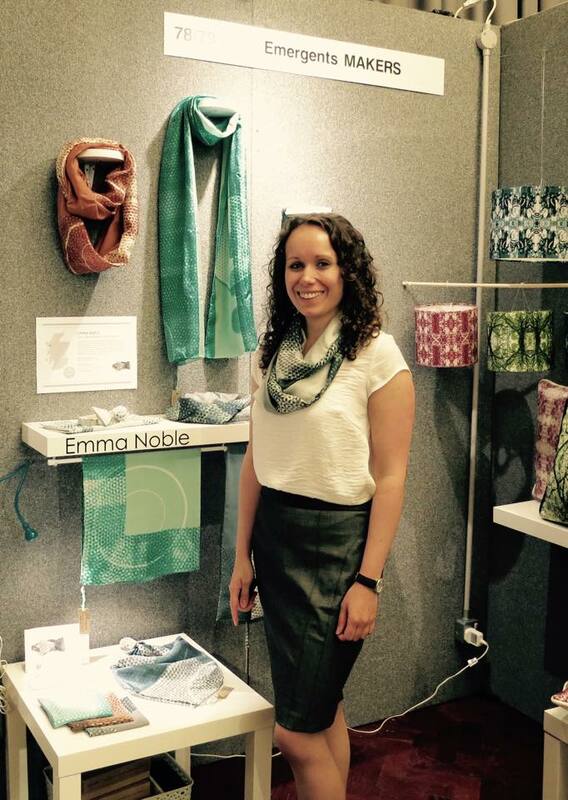 However, unlike many of her contemporaries, she returned to her home village, where she eventually set up her own business, Emma Noble Prints. It was interesting to see how she is building up the business by offering a range of design services, combined with picture framing and her own art and textile design. So many young Highlanders leave their communities to study after school and those who want to return struggle to do so, but Emma’s example shows that it is possible, with a lot of hard work. She travels away to market her textiles, so as to establish this aspect of her business, but is mainly based in Kyle. The photograph shows her at a recent show in Cheltenham.